Thank you to everyone who came out to meet Patrick Lose! It was a successful evening and I think everyone who showed up had a wonderful time! Congratulations to Vicky and Linda who won our BoHo Happy fat quarter bundles! Patrick was so surprised and happy to see all the quilts hanging in our classroom! Thanks to everyone who shared their quilts! The classroom looked amazing! 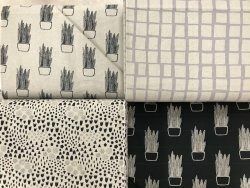 We received in this gorgeous blender line from Andover Fabrics. The line is called Pick-up Sticks! For those of you who like to make purses, this canvas line from Andover Fabrics is for you! It's cute and versatile and will make a great purse or wallet. Sorry, there will be no fat quarters cut of this line of fabric. I love this time of year! I am a BIG State Fair Fan! My daughter's and I have competed in Fabric and Threads and the Food Competitions for years! We are a family that goes to the fair daily, even if it is just for lunch! On Sunday, I had the honor of teaching the Traveling Pinkeep Class in the Patrick Lose Classroom. We had a great time sewing this project! I will be teaching this class at Creekside this fall, if you would still like to make this pinkeep, but missed us at the fair. My daughter Julia Corey and her first attempt at quilting! She did excellent and may be one of our competitors next year! 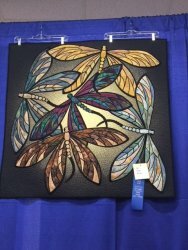 This year, I competed in the Fabric's and Threads category of a Hand Applique Quilt Smaller than 300 inches and won a Honorable Mention! 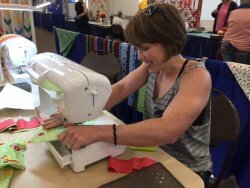 I'm just honored to be included in the ribbon winning category, as there were over 750 quilts entered this year! Congratulations to everyone who entered, as it takes courage to have your pride and joy critiqued by another group of people. For those of you who were not able to attend the fair this year, here is a peak at a few of my favorite quilts! You can also check us out on Facebook, as I have been posting pictures of quilts on our Facebook page. 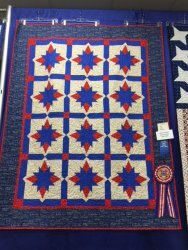 Julie McNair's patriotic quilt won the Quilt of Valor Award sponsored by Central Iowa Sew-ciety. 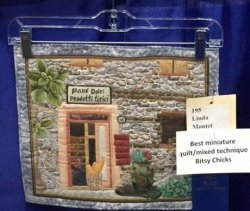 Linda Montet won the award Best Miniature Quilt/Mixed Technique sponsored by the Bitsy Chicks. This quilt by Joan Kerns, is just one of my favorites! There are so many beautiful quilts, it truly is hard to pick just a few to share in this newsletter or post on Facebook. I will add more next week! 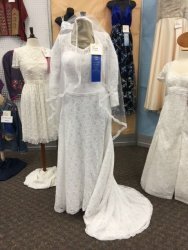 Congratulations to everyone who entered a project in the state fair! 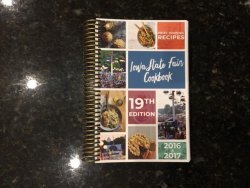 Also, you can buy the 19th Edition of the Iowa State Fair Cookbook, I have a couple of my winning recipes published! That was a fun honor to receive the call, "Would you mind if we put your recipes in the our upcoming cookbook?" It took me like, 2 seconds to say "No, that would be wonderful!" Very honored! This class has been moved to Sunday August 26th from 1-4 pm. 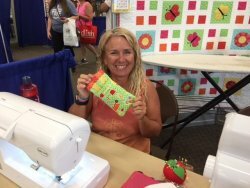 Tracy is an excellent teacher and we learned a lot from her in her 1st Beginning Garment Making Class. 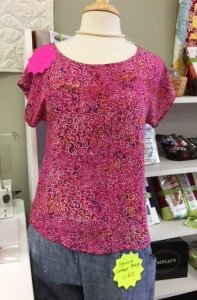 This top is a great first project for anyone thinking about sewing their own clothing. If you do not like the idea of short sleeves, Tracy will help you design the top to add length to the sleeve. Class is $25 and the pattern is $18. 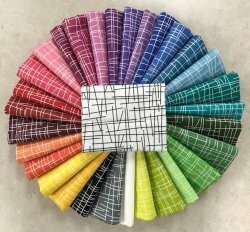 After reading this newsletter, you may be feeling inspired to start a new project, so let's get started with 15% off all patterns.